Italian authorities said, on Thursday 04/28/2016, they have thwarted an I.S.I.S attack in Italy. 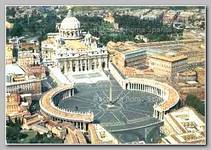 Amongst the targets were the Vatican and the Israeli Embassy in Rome. Two members of the cell. an Italian-Moroccan couple. Mohamed Koraichi & his wife, who left to join ISIS in 2015 with three small children. have already moved to ISIS controlled territory. Mohamed Koraichi had become an ISIS fighter and had communicated the orders to carry out attacks in Italy while making arrangements for the other family to join ISIS. Mohamed Koraichi’s sister is among the four detainees in the plot . Arrest warrants were issued for six cell members affiliated with ISIS on Thursday evening, four of which planned to attack the Israeli Embassy in Rome and the Vatican. Milan prosecutor Maurizio Romanelli told reporters that investigators intercepted communications from within ISIS held territory ordering attacks in Italy, “with particular attention to the city of Rome” and focusing on the Holy Year pilgrimage now underway. He said the messages promoting lone-wolf attacks were “very strong, very serious and very efficient,” indicating that ISIS’s current policy is to push for attacks in locations where foreign fighters are residing “as the best way of creating terror within Western countries. Interior Minister Angelino Alfano said authorities acted quickly to close the investigation, arresting four people in the northern Lombardy region and issuing arrest warrants for two others believed to be in ISIS territory. Angelino Alfano said the death in battle late last year of a foreign fighter with ties to the group within ISIS territory had contributed to the radicalization process. The fighter had been expelled from both Italy in 2015 and later from Switzerland before traveling to ISIS territory, where he was killed. Italian Authorities arrested the Moroccan-born man, identified as Abderrahim Moutahrrick, and his wife, Salma Bencharki (pic-L), who allegedly were planning on traveling from their home in Lecco, north of Milan, to ISIS territory with their children aged 2 and 4. Romanelli said Moutahrrick had taken Italian citizenship and was an accomplished kick boxer. Another Moroccan man who was planning to travel with them, identified as Abderrahmane Khachia (L), 23, was arrested in the northern city of Varese, prosecutors said. It was the death of his elder brother that prosecutors identified as the radicalizing event.